PLUTO, the small 2-way active loudspeaker system that was introduced in 2005 has undergone several changes to improve its acoustic performance and to make it easier to build. Most significantly the woofer/midrange driver was replaced by a special Seas unit to obtain lower non-linear distortion and increased bass output. This became Pluto-2 . It required component changes on the printed circuit board of the original PLUTO to update the equalization and crossover for the new driver. Also a new mounting scheme was introduced for the woofer/midrange driver to improve the looks and to provide an alternative in situations where the original rubber pipe coupler is difficult to find or not desired. 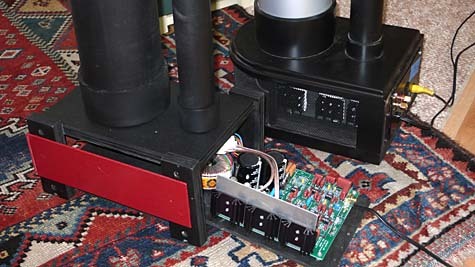 The base, which houses the two power amplifiers, the electronic crossover and equalization, was increased in size to make room for larger heat sinks, for ventilation and for easier access to the circuit board. No changes were made in the tweeter selection. The Aura driver is instrumental to the omni-directional PLUTO concept since this tweeter allows for a low 1 kHz crossover frequency and uniform radiation over large off-axis angles up to several kHz due to its small external dimension. I am not aware of another equally well suited driver for this application. I have built, measured and listened to a number of Pluto-2 systems both at home and in other locations. The new Seas driver had required a change in equalization. That change indicated further potential for refinement and I have revisited the equalization process as if starting new. 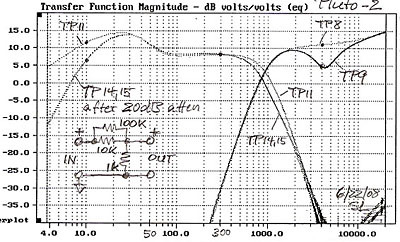 Equalization in my loudspeaker designs is usually a correction of trends in the frequency response. The measured frequency response often hides these trends in some fine grain structure. The fine grain structure is usually the result of reflections in the measurement environment and diffraction from the loudspeaker cabinet. Thus the chosen equalization for a seemingly flat on-axis response may not yield a flat response, if the artifacts could have been removed. Some educated guess work is involved in equalization. It yields more realistic results than the blind equalization of every detail often used in computer software. It is not surprising then that re-equalization can lead to somewhat different woofer and tweeter drive signal frequency responses, especially when the underlying physical phenomena are better understood. The low frequency equalization was left unchanged but the midrange, crossover region and tweeter notch were modified. The tweeter level was reduced by 2.5 dB. The 220 Hz notch corrects for the remainder of the attenuated half-wavelength pipe resonance. The audible effect of this is a warmer presentation with an increase in low bass. There is no loss in neutrality or transparency. The all-important voice range is rendered naturally. PLUTO-2.1 is a worthy alternative to ORION+ when cost, size or room placement do not allow for a large system at this time. 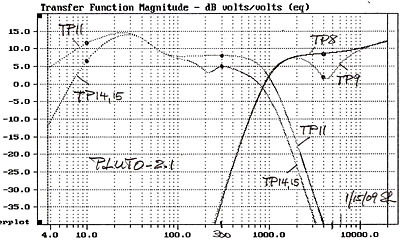 If you think that you need another octave of bass, then you could add the PLUTO+ subwoofer, but you should wait with that decision until you have lived with PLUTO-2.1 for a while. This is such an enjoyable speaker system by itself that the doubling of expenses for the subs may not be necessary. You can drive these speakers directly from a universal player that has volume controls, such as the OPPO DV-980H, from an iPod, a laptop, from the outputs of your preamplifier or the loudspeaker output terminals of a receiver. 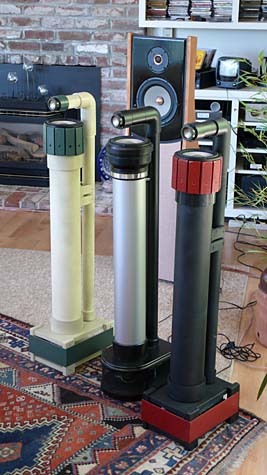 The most cost effective way for acquiring the PLUTO-2.1 loudspeakers is to build them yourself. The PLUTO documentation and its updates on the owner-support page provide detailed information and ongoing support. The loudspeakers can also be purchased ready made from Wood Artistry. Of course, you now pay someone else for turning basic plumbing materials that you can find in a local hardware store into a unique looking product' You pay for fit and finish, for assembling and testing the electronics and getting it all safely to your place. This might be the most expedient way for you to become a PLUTO owner. Don Naples will thank you for it. I talked about Hearing Spatial Detail in Stereo Recordings and used a pair of PLUTO-2.1 to illustrate differences in recording techniques at the 26th Tonmeistertagung in Leipzig, Germany, 2010. Do-it-yourself and Wood Artistry versions of PLUTO-2.1 that show construction and finish alternatives. The enclosure is made up of 4 inch and 1.5 inch or equivalent metric PVC or ABS plumbing pipes that must be cut to length and of associated end caps, knees and pipe couplers. The mounting section for the woofer/midrange driver can be a rubber plastic-to-clay pipe adapter or a wooden crown that is assembled around a standard pipe coupler. The same electronics assembly works for either construction. Power amplifiers, electronic crossover and equalization are built into the base. Construction requires the ability to follow the labeling on a printed circuit board for placement of electronic components with leads into wire holes and then soldering them to circuit pads. The components are described in a material list and are ordered from suggested suppliers. The housing is a simple wooden box. 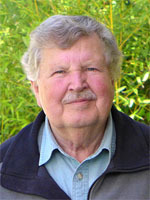 A review of the earlier Pluto-2 loudspeaker has been published by Peter Aczel of The Audio Critic. CAUTION: The content of these pages may change without notice as I learn new things or find better descriptions. The designs presented here may change as I make new observations or gain more insight. I see myself as a seeker of truth, though I now know that every person is, and ultimately truth is a construct. There is only this. Maybe what has been done here points you to it. Audio has overwhelmingly been a hobby for me, for my own pleasure and love of music. I enjoy to share what I found and possibly to dispel a few misconceptions. My interest is not on the business side, though I like that my activities pay for my hobbies. You may not agree with some or all aspects of my designs, the approach that I take to them, or the theories. I have no problem with that. Just do not ask me "what would happen if ...". Changes that you make to the designs are for your own pleasure and at your own risk. But if you learn something worthwhile, then please let me know. My DIY projects are not for beginners and it may be necessary for you to buy subassemblies or a turnkey system from Wood Artistry. Please do not ask me for individual help with your DIY difficulties. All my designs have a Support Page. 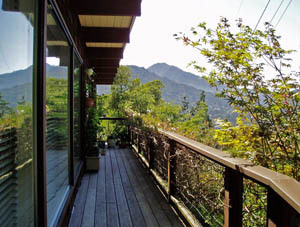 It is listed on the cover or inside of your project documentation. There is an ORION/PLUTO/LX521 Users Group with people who can help you. I respond to every email eventually, but you may not get the answer you want. I consider my writings in these web pages as brief and to the point. I labor over every sentence and word and provide little redundancy. Read thoroughly and maybe more than once. I do not write for the rank beginner, but for those who have been around the block. You may need to study up. The links in my text are for that. I have not been standing still since I started this website in 1999 and with the idea of a brain dump of my previous findings so they would not get lost to the audio community. In 2006, after PLUTO, I thought I would go into a support and maintenance mode. No new design. Stuff happened, more enjoyment to share. The recording and rendering process interests me most at this time. Therefore the LX521. Let's see what it will do. I could stop now and be content with what has been accomplished.